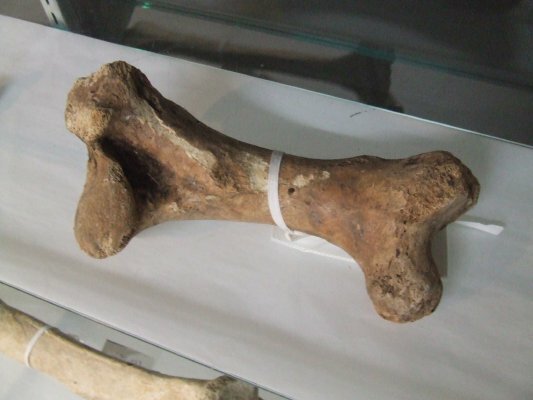 Description One moa bone, possibly a hip bone, though said to be a leg bone. Originally in accession 2005.022 in box Y and said to be from the Elvy Collection. Removed by Jenny Pierson 10/12/2008 so that it can go on display (see notes). Has a hole drilled in one side for DNA testing made circa 2008 by Nic Rawlence of Adelaide University. 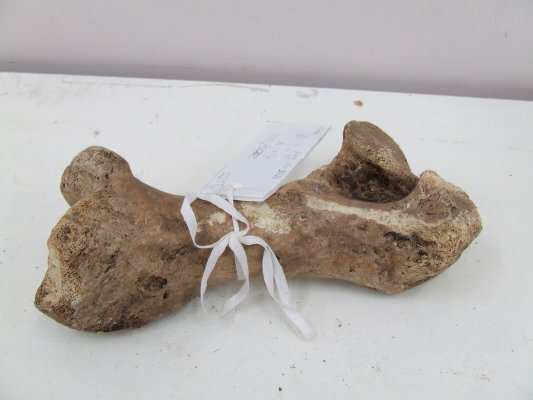 Information from Professor Richard Holdaway of Canterbury Museum 25 August 2012: This is the left femur (thigh) bone of a Dinornis robustus (Giant Moa) of about 2 years of age. "South Island giant moa - Dinornis robustus. Although giant moa occurred in the North Island, the very largest birds were probably in the South Island. The single largest moa leg bone ever found - a 1-metre-long tibia [shinbone] was at North Canterbury's Glenmark swamp. Like their northern counterparts, South Islnd giant moa were relatively slender, and their skulls and beaks had a flattened appearance. The two mummified remains of this species (from Knobby Range and Tiger Hill, both in Otago) preserve the large scales of the lower leg and show that the species had prominent footpads. The robust jaws of giant moa, and the fact that they had relatively large collections of gizzard stones for grinding up food, indicate a diet high in fibrous material. This has been borne out by analyses of food found in preserved gizzards of South Island giant moa; these contained numerous twigs, as well as the remains of berries, but few herbs or grasses. This species clearly browsed on the leaves and branchlets of shrubs, trees and vines. The South Island giant moa was widespread in areas of forest and more open, low-altitude regions, but its remains have been found in caves in the subalpine zones as well. Several swamps on the Canterbury Plains have preserved large numbers of giant moa, most famously at Pyramid Valley, the site of a spectacular collection of fossil bird remains from a wide number of species, including 64 beautifully preserved giant moa skeletons. The South Island giant moa is common in archaeological middens. The largest known moa egg (240 millimetres x 178 millimetres) belongs to this species and must have long been considered a great taonga [treasure], as it was associated with a human burial site at Kaikoura. Distribution: South, Stewart and D'Urville Islands. Time of extinction: About 1400 AD. Primary cause of extinction: Human hunting. Weight: Females 76-242 kg; males 34-85 kg. Meaning of Scientific name: Described by Owen in 1846; he considered its leg bones to be 'stronger' than those of other Dinornis, hence robustus. Number of specimens known: Fossil remains of hundreds of individuals; 1 largely complete egg.